LANSING (APRIL 27, 2018) — They want to legalize marijuana, increase the minimum wage or boost the use of renewable energy. And they’re raising lots and lots of money. They are the ballot campaigns that want to change Michigan law by gathering enough signatures to allow their proposals to avoid the normal legislative process. According to new disclosures this week, the eight most active ballot campaigns have already combined to raise $12.3 million. The new disclosures cover through April 20. Much of the money has come from a small number of interest groups. Of the $12.3 million, $7.7 million can be traced back to just six organizations and their affiliates. The fundraising numbers could go up quickly if multiple proposals make the 2018 ballot. In 2012, there were six proposals on the ballot. Ballot committees combined to raise $154 million for that election. Seven of the ballot campaigns have individually collected more than $1 million in direct and in-kind contributions. In-kind contributions are goods and services provided to support a campaign. To see more information on the campaigns’ top donors, go to mcfn.org/ballotproposals. The only campaign of the seven that’s given up on getting its proposal approved in 2018 is Clean MI, which aimed to institute a part-time legislature. 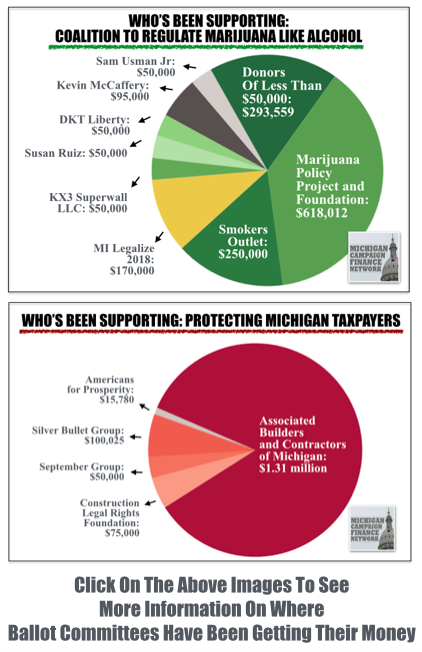 The majority of Clean MI’s money came from the Fund for Michigan Jobs, a nonprofit connected to Lt. Gov. Brian Calley. It gave $1.05 million. 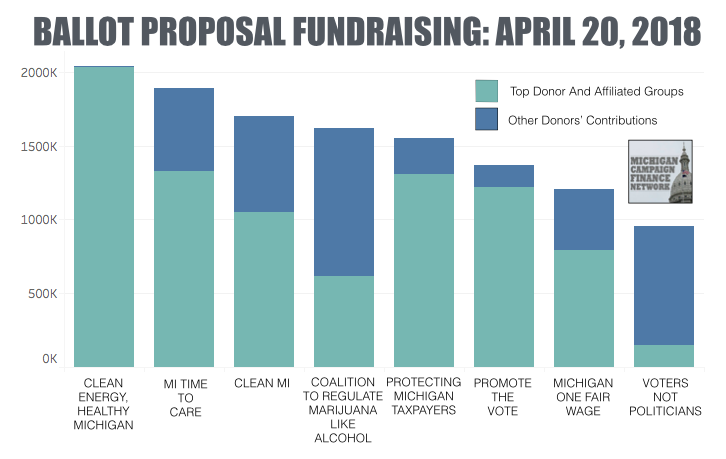 Of the proposals still alive, Clean Energy, Healthy Michigan, which wants to increase the state’s renewable energy standard, has raised the most money at $2.04 million, according to campaign finance reports. All but $100 of that support has come from either NextGen Climate Action or NextGen America, two organizations connected to California businessman Tom Steyer. Clean Energy, Healthy Michigan is still in the signature-gathering process along with MI Time to Care and Michigan One Fair Wage. MI Time to Care would require employers to provide earned sick time for workers. It's raised $1.89 million in support. Of that total, the Washington, D.C.-based Sixteen Thirty Fund, a nonprofit organization, gave $1.33 million. The Michigan One Fair Wage campaign would increase the state’s minimum wage to $12 an hour. It’s raised $1.21 million with $790,275 coming from groups connected to the Restaurant Opportunities Centers, which advocates on behalf of restaurant workers. Two other ballot committees, the Coalition to Regulate Marijuana Like Alcohol and Protecting Michigan Taxpayers, have already submitted their signatures to the state. The Coalition to Regulate Marijuana Like Alcohol wants to legalize marijuana and has raised $1.6 million. Its top donor has been the nonprofit Marijuana Policy Project and its affiliates. They’ve provided $618,012 in support. The Coalition to Regulate Marijuana Like Alcohol aims to initiate a new law. Its proposal is poised to go before the Legislature, which could approve it or leave it up to voters to decide. Protecting Michigan Taxpayers wants to repeal the state’s prevailing wage law, which sets wage standards for state-funded construction projects. The campaign has raised $1.55 million. The Associated Builders and Contractors have provided $1.31 million of the total. Protecting Michigan Taxpayers failed this week to get its petitions approved and is now in legal limbo, according to media reports. Two others, Promote the Vote and Voters Not Politicians, want to amend the Michigan Constitution. If they get enough valid signatures, their proposals will go on the ballot. Promote the Vote, which would allow for no-reason absentee voting along with election changes, has raised $1.37 million. The American Civil Liberties Union and connected organizations have provided $1.22 million of that total. Voters Not Politicians has raised $959,136 and had the broadest base of support, reporting more than 10,000 individual contributions. The largest donor has been the nonprofit Beckwith Constitutional Liberties Fund, which gave $150,000. A handful of committees to oppose the ballot proposals are also starting to gather their financial backing. Healthy and Productive Michigan plans to oppose marijuana legalization. It’s raised $276,020 with $275,000 coming from Virginia-based Smart Approaches to Marijuana Action. Protect Michigan Jobs has been opposing prevailing wage repeal. It’s raised $924,465 with most of its money coming from labor groups. The Michigan Chamber of Commerce-connected Citizens Protecting Michigan’s Constitution could oppose multiple ballot proposals. It’s raised $372,351. John Kennedy, of Autocam, gave $100,000 and Virginia-based Fair Lines America, which appears to be focused on redistricting, gave $50,000. On Friday, the committee filed a legal challenge against the Voters Not Politicians proposal, according to the Associated Press. Another ballot committee, Michigan Opportunity, received $100,000 from the Michigan Restaurant Association on April 2. Michigan Opportunity hasn’t officially declared which ballot proposals it will oppose, but the Michigan Restaurant Association has called opposing the minimum wage increase a top priority, according to the Detroit Free Press.